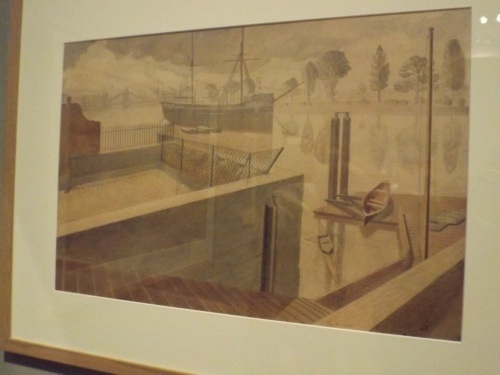 The Ravilious exhibition of 80 watercolours Dulwich Picture Gallery has just two featuring the Thames but both are very interesting. 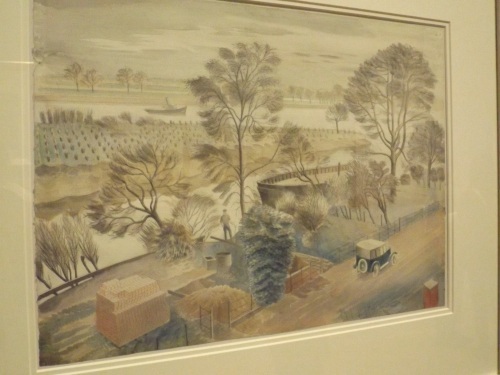 In 1931 young Eric Ravilious and his wife Tirzah moved into a riverside flat at Hammersmith. The view was of the Thames with Chiswick Eyot directly opposite. It was this view which Eric painted in 1933. The houses have small riverside gardens separated from by the road which in the Thirties was quiet since the residences were not fashionable and were largely occupied by artists. In River Thames at Hammersmith 1933 the towpath bank opposite looks even more rural than today. But the most arresting of the two Thames pictures is one called The Stork at Hammersmith 1932. The Stork was not a pub but fifty year old HMS Stork which was anchored in the river upstream of Hammersmith Bridge to serve as a training ship for boys interested in a Naval career. It had been a landmark since squeezing under Hammersmith Bridge in 1913 and remained a gently moving landmark until 1950. Its arrival was not welcomed but its loss was like the Pool of London having to say farewell to HMS Belfast. Among items on show is a letter addressed to fellow student Helen Binyon at ‘Streatley Berks’. This suggests more Thames associations but, although this is Streatley opposite Goring, the farmhouse is some way from the River Thames. Ravilious is at Dulwich Picture Gallery until Bank Holiday Monday 31 August; open Tue-Sun admission £12.50 (OAP £11.50; student £6).